The title of this post isn’t directly related to the feature photo, but I couldn’t resist posting the photo of the beautiful pasta dish. This morning I was craving some food from Alimentari, specifically long pasta with a simple tomato sauce. I’ve actually been thinking about it ever since we visited the shop for arborio rice during the Canada Day weekend. Hubs had just woken up, and I was on my way to the library. When I got home, he was not home, but I could smell tomatoes and garlic simmering. That is the Best. Aroma. Ever. Shortly after, hubs returned home. He had biked to get some Italian-made spaghetti and fresh tomatoes. I noticed more zucchini flowers when I was watering my plants, so I decided to cut two of the male flowers to fry up. 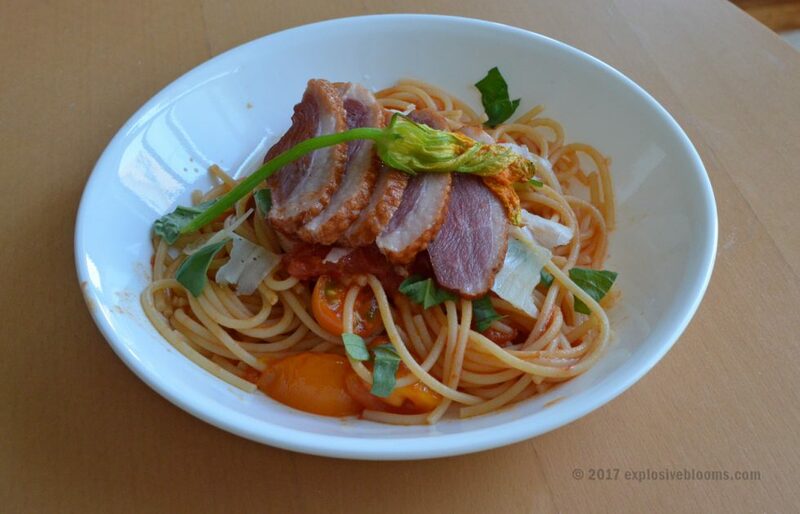 Although I could have done without the smoked duck breast, the saltiness was a good pairing with the tomato pasta. It was such a delicious lunch. I licked my plate clean. And hubs really like the fresh zucchini flower. I totally understand why some people only grow squash for the flowers. 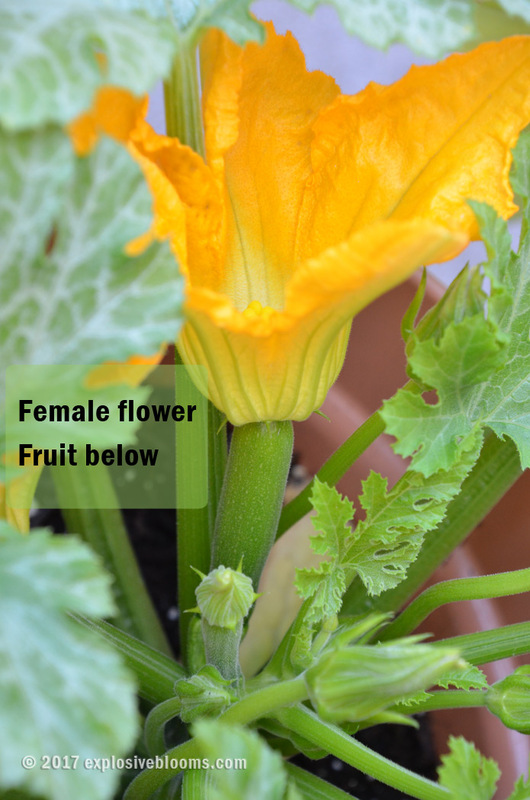 It’s delicious and unlike some other beautiful edible flowers, this one has the mild sweetness of zucchini. It also retains the beautiful orange colour during cooking. The most common way zucchini flowers are prepared is stuffed with a mild cheese (ricotta), battered lightly, and deep fried. But let me tell you, it tastes just as good pan fried with some oil and finished with a bit of salt. I had noticed three blooming male flowers in the pot today, so I decided it was safe to pick two of them to eat. 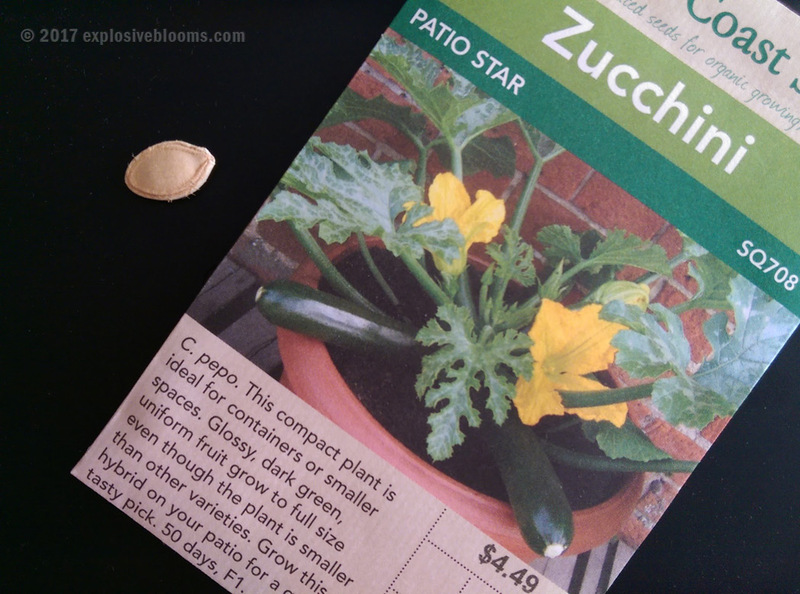 I’m really impressed with the Patio Star zucchini and it’s definitely on my list to grow again next year. And I will be sure to grow more than one. As always, I am amazed at how this beautiful plant was just a small squash-sized seed on May 22. 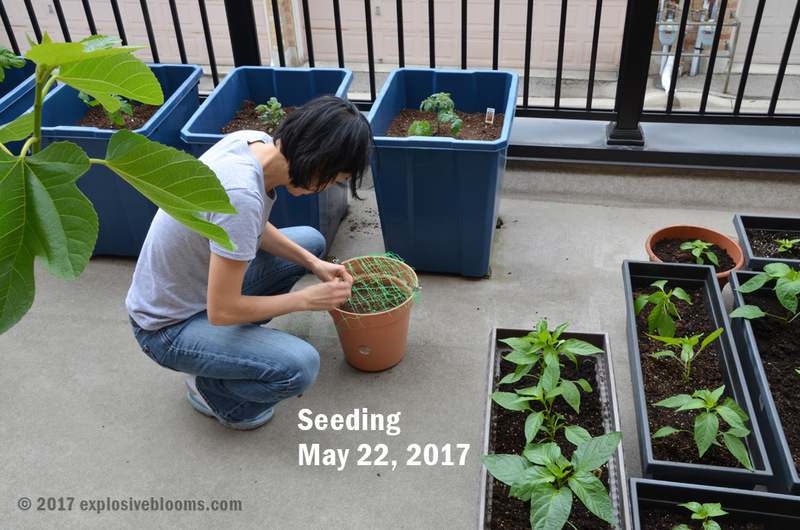 I originally put two seeds into this container, but only one germinated. I’m actually glad, because there is no way that two plants would have fit in this pot! For other progress photos, visit my June Garden Update post. 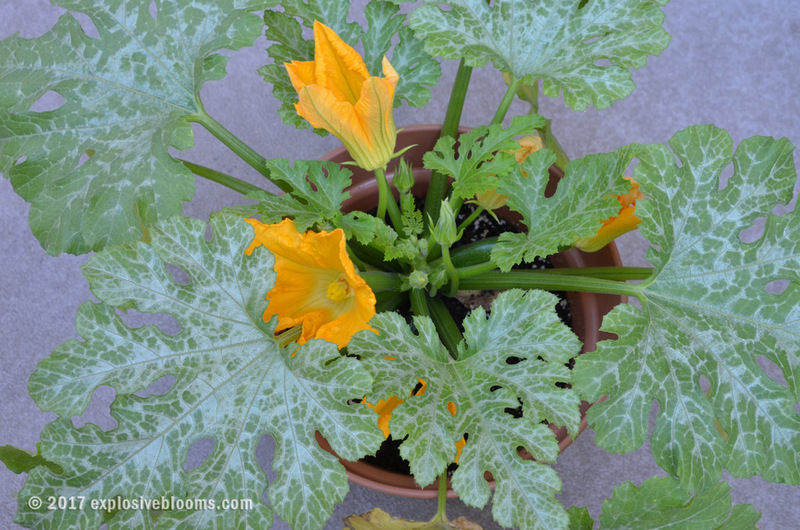 After I harvested the first zucchini just a few days ago, there has been an explosion of activity in this pot. Which are the male flowers? 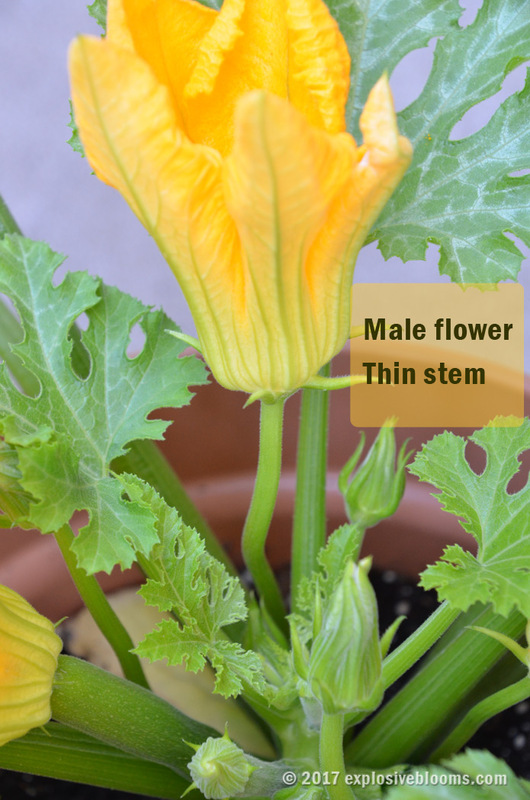 I left one male flower in tact as I’m guessing it is necessary to cross-pollinate with the female flowers. Which are the females? I’m not sure if it made a difference, but my zucchini plant is next to my pot of African Marigolds – big, bright yellow flowers. I wonder if the flowers helped to attract pollinators? I cannot wait to harvest more zucchini and zucchini flowers! And I highly recommend you add this to your garden next year.